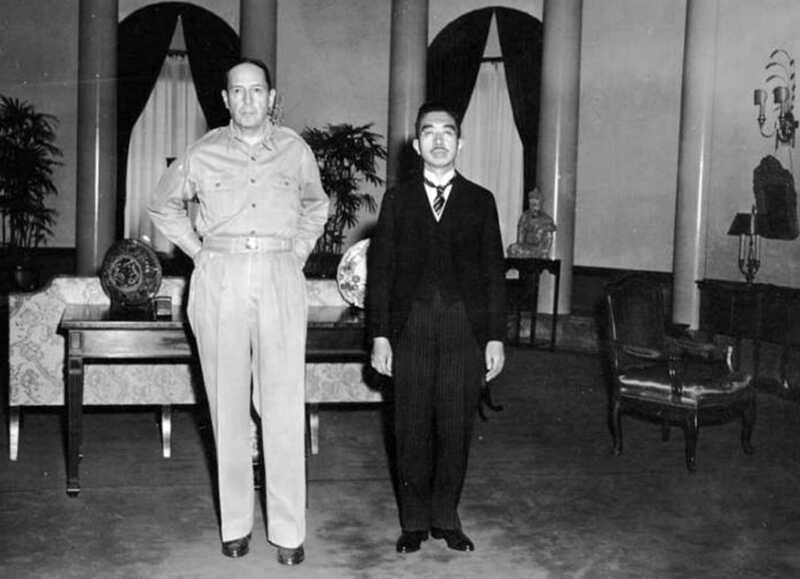 Emperor Hirohito and General MacArthur, at their first meeting, at the U.S. Embassy, Tokyo, 27 September, 1945. U.S. Army. On the morning of September 8, 1945, General Douglas MacArthur made his way by automobile toward the American Embassy in the heart of Tokyo. One American observer described it as a city "completely flat with destruction," where even "the rubble did not look like much." As he presided over a ceremony at the Embassy -- his home for the next five and a half years -- MacArthur ordered General Eichelberger to "have our country's flag unfurled, and in Tokyo's sun let it wave in its full glory as a symbol of hope for the oppressed and as a harbinger of victory for the right." This moment was not broadcast throughout the world as the surrender ceremony aboard the U.S.S. Missouri had been six days earlier. Yet in hindsight, it was just as symbolic of the occupation period to follow: optimistic, thoroughly American, and unmistakably MacArthur. Although the occupation was nominally an allied enterprise -- MacArthur's title was Supreme Commander for the Allied Powers, or SCAP -- it was very much an American show, and there was no doubt who was in charge. As historian Michael Schaller has noted, "From its inception, the occupation became synonymous with its supreme commander. Although few Americans could name the man in charge of the German occupation (General Lucius Clay and, later, John J. McCloy) most could readily identify the top man in Tokyo." In fact, most of the basic principles and policies for the occupation were drawn up by planners in Washington in the last two years of the war (and are contained in a document known as SWNCC 228). While the impression that MacArthur was behind everything that happened in Japan far exceeds the reality, he deserves a great deal of credit for what most people agree was a highly successful occupation. Initiating some policies and skillfully implementing many others, MacArthur helped a defeated and destroyed nation transform itself with remarkable speed. Students of the occupation period are stunned by how readily the Japanese remade their country along an American model. Although this is often ascribed to the particular Japanese talent for adapting foreign concepts for their own use, many of the changes wrought during the occupation had roots in pre-war Japanese reform movements. Still, MacArthur's prestige was such that his support could make or break almost any single cause. Among those encouraged by MacArthur and his staff were democratic elections ("This is democracy!" he exclaimed after the elections of 1947); basic civil liberties, including steps toward equality for women; the unionization of labor, despite his banning of a General Strike in January, 1947; land reform, which sought to "eliminate the feudal system of land tenure and remove obstacles to the redistribution of land"; and the Japanese Constitution itself, particularly Article 9 outlawing war and guarding against remilitarization. Even with all of these accomplishments, MacArthur's greatest disappointment may have been his failure to convert the Japanese masses to Christianity, despite his conviction that "true democracy can exist only on a spiritual foundation," and will "endure when it rests firmly on the Christian conception of the individual and society." Appropriately, MacArthur established his General Headquarters, or GHQ, in the Dai Ichi Insurance Building in central Tokyo, the higher floors of which overlooked the Imperial Palace. MacArthur's steadfast resolution to protect Emperor Hirohito -- "through him it will be possible to maintain a completely orderly government" -- probably ranks as the single most important decision of the occupation. Considering how well things went, MacArthur's decision seems vindicated; yet many historians argue that once the occupation had begun to run smoothly, MacArthur should have allowed the Emperor to abdicate the throne, thereby acknowledging his and the country's responsibility for the war. As historian John Dower says, "From the Japanese perspective, you have a man who becomes America's symbol of democracy, who is totally sanitized by the Americans and by MacArthur, in particular.... I think that that poisoned the thinking about responsibility in general, in Japan, to the present day." Nonetheless, it is remarkable that a man best known as one of the greatest soldiers in American history may have made his greatest contribution during a time of peace. Significantly, MacArthur biographer D. Clayton James once wrote that he decided to undertake his three volume study "with the conviction that a century hence MacArthur will be most appreciated for his role as an administrator, rather than as a warrior." From the very beginning, it was clear that a primary objective of the occupation of Japan would be, as the Potsdam Declaration put it, "a peacefully inclined and responsible government" based on "the freely expressed will of the Japanese people." MacArthur himself commented early on that meeting this goal would certainly require a "revision of the Meiji Constitution." But even he could not have imagined that a few months later, his young American staff would write an entirely new constitution, one that has governed Japanese affairs ever since without the change of a comma. And one morning I came in..., it was ten a.m. and General Whitney [head of the government section] called us into a meeting room. It was too small for all of us. Some of us had to stand because there were about 25 of us. And he said, "You are now a constituent assembly." You can imagine how we felt. "And you will write the Japanese constitution. You will write a draft and it will have to be done in a week." Well, I mean, we were stunned of course. But, on the other hand, when you're in the army and you get an order, you just do it. You just go ahead. Mrs. Gordon then recounts how she raced around the still-decimated Tokyo in a jeep, collecting all of the foreign constitutions she could find to provide models for the new "constituent assembly." Their work resulted in a thoroughly progressive document. Although the emperor was acknowledged as the head of state, he was stripped of any real power and essentially became a constitutional monarch. A bi-cameral legislature with a weak upper chamber was established, and with the exception of the Imperial family, all rights of peerage were abolished. Thirty-nine articles dealt with what MacArthur called "basic human liberties," including not only most of the American bill of rights, but such things as universal adult sufferage, labor's right to organize, and a host of marriage and property rights for women. But the most unique and one of the most important provisions came in Article 9, which outlawed the creation of armed forces and the right to make war. It's not clear whether or not the "No-war clause" originated with MacArthur, but it certainly would not have been included without him, and its presence in the constitution has had an enormous impact on Japan's postwar history. 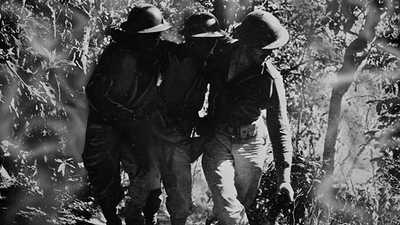 After marathon negotiations in early March, Japanese officials accepted the American draft with only minor revisions. 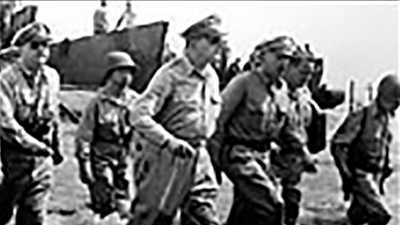 General Whitney's comment at the outset -- "if the cabinet [is] unable to prepare a suitable and acceptable draft.... General MacArthur [is] prepared to lay this statement of principle directly before the people" -- probably helped. 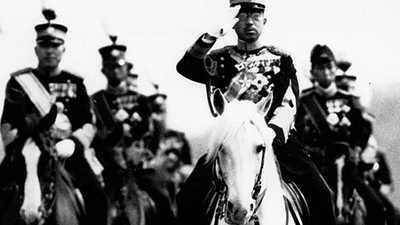 Emperor Hirohito, chagrined at having lost so much power but grateful that the throne had been retained, issued an "imperial rescript" endorsing the draft. That fall, after the Japanese people had voted overwhelmingly for candidates who backed the new consitution, Hirohito himself promulgated it before the Diet (Japanese Parliament). Although it ignored his own role in its birth, General MacArthur's message to the nation offered a pretty fair assessment: "The adoption of this liberal charter, together with other progressive measures enacted by the Diet, lays a very solid foundation for the new Japan." Despite fighting courageously against an enemy with superior firepower, MacArthur's forces were pushed steadily back and grew weaker by the day. Roughly two-thirds of the POWs were shipped out for labour as MacArthur returned in 1944.